Why Buy a Sports Attack Cricket Machine? 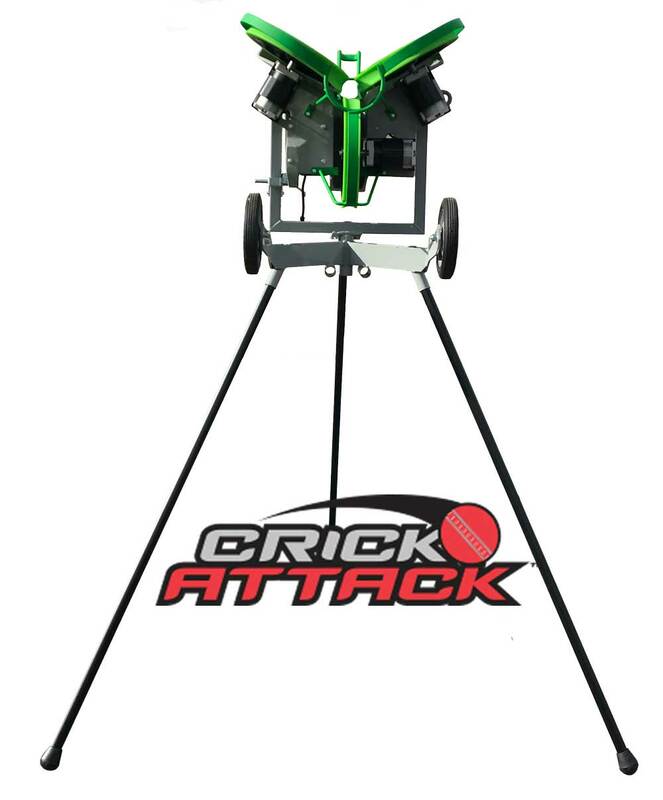 The Crick Attack is revolutionizing cricket batting practice! The Crick Attack is a high performance machine that was designed to bowl realistic deliveries, just as if you were facing a bowler out in the middle. Our patented vision technology allows the batsmen to track the ball all the way through to delivery. Batsmen can now set and do their trigger movements as if facing a real live bowler out in the middle. With the Crick Attack the batsmen can now bat against a bowling machine without having to pre meditate shots or guess when the ball will be delivered. Unlike other competitive machines, the Crick Attack uses leather cricket balls. Finally your batsmen can bat against leather balls! Batsmen automatically feel the leather ball on the bat and know if they have middled the ball or not. And because of the three wheels, the Crick attack delivers the ball seam up, this gives you variable movement off the seam as well as the machine having the ability to bowl an authentic swing delivery. The Crick Attack has a measured ball chute, the distance has been calculated to match the speed of an average bowling action. The batsman can see the ball all the way through to delivery as it is not obscured. This helps with trigger movements and getting set as if facing a real live bowler in the middle. Timing is improved as your stroke play and shots are not rushed as is the case when batting against conventional bowling machines. The specially formulated compound on of the throwing wheels is not only expected to last 10+ years, but they are designed to use leather cricket balls. Batsmen can now pad up and face leather balls which have a different feel on the bat as opposed to synthetic bowling machine balls which you never really know if you have middled off the bat or not. The Crick Attack can also use synthetic dimple bowling machine balls. Opening batsmen can have realistic batting sessions facing brand new leather balls if desired, the wheels don’t damage the ball but you would need to shine the ball as in a game if you wanted to maintain shine. The three wheels are designed to pinch the ball at three points, this allows the coach to control not only velocity but also revolutions on the ball in 3D, because of this the Crick Attack can deliver the ball seam up and with slight adjustments on the dials enables you to deliver realistic swing deliveries as a real live bowler would. All adjustments and change of deliveries are done by controlling the three dials and using the height and direction levers, there is no need to angle or slope the head of the machine to deliver various deliveries. The three high powered motors that can be independently controlled allows you to deliver balls up to speeds of 100 mph. Bright green wheels, chute and guard will provide dramatic contrast to any color cricket ball, especially red leather, and enabling batter to quickly pick up and follow the ball through the entire movement through the machine. Horizontal movement of the throwing is quick between bowls, keeping batters always focused and attentive not knowing what is coming next. The Crick Attack machine quickly moves on and off the field by just tilting it, un-socketing the legs and easily rolling it on two heavy-duty transporting wheels. This effective training tool makes most efficient use of practice time with limited throwing head adjustments needed and an almost instant recovery time.